On Thursday, February the 7th, 2019, the home affairs session of the informal meeting of the Justice and Home Affairs Council took place, in the context of Romania’s holding the Presidency of the Council of the European Union. The ministers discussed about anti-terrorism initiatives, strengthening police cooperation, restoring the full functionality of the Schengen area, migration and asylum. “Facing with the multiple problems that illegal migration represents, a single solution is needed in order to respond to all reported concerns at the level of European Union States. We do not need now antagonistic solutions that fuel populism, extremism and disrupt political cohesion within the EU. But, of course, we need to be constructive in order to find a common solution based on consensus. Migration is supposed to represent a vector of development for each Member State and not an additional burden, “said the Romanian Minister of Internal Affairs, Mrs. Carmen Dan. Starting from the Commission’s proposal to develop “temporary arrangements” limited by time, that could serve as a bridge until implementing the Dublin Regulation, the Home Affairs Ministers held open and constructive discussions in Bucharest. The Romanian Presidency will continue its efforts to identify consensual solutions in the field of migration. As part of efforts to reduce illegal migration flows towards the EU, the external dimension of migration and cooperation with third countries is a priority. When adopted in May 2015, the European Migration Agenda proposed countering migration crisis by presenting solutions related to all aspects of the migration phenomenon, trying to achieve results from their combined effects. A key element was the Common European Asylum System in which a central role is played by the amendment of the Dublin Regulation. Although many steps have been taken at all levels, efforts need to be continued in order to create a resilient instrument for future crises. 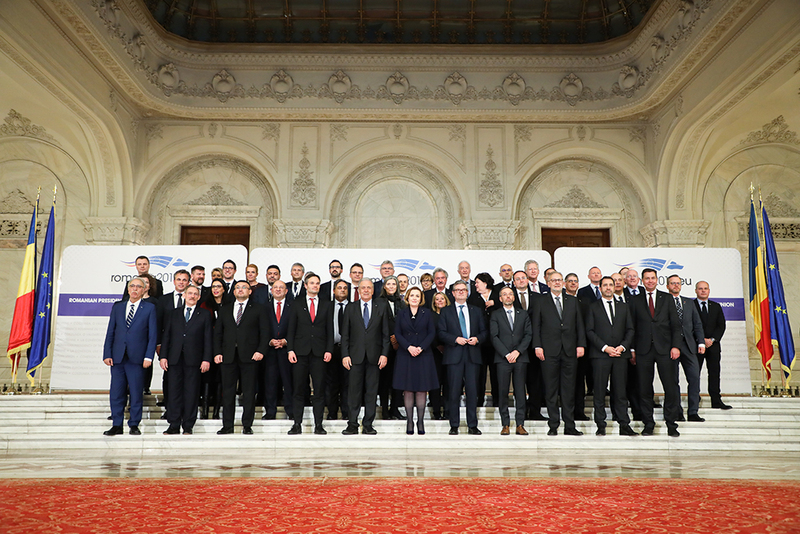 The discussions during the working lunch were dedicated to one of the most important achievements of European integration – the Schengen area, recognized as one of the key instruments by which European citizens can exercise their freedoms, and the internal market can prosper and develop. ”Concerning the Schengen area, discussions have been conducted around the short and medium term measures that Member States consider necessary to restore the functioning of this area affected by the terrorist and migration crises that the Union has experienced in the last period. Beside de representatives of the EC and EP, who constantly advocated for România and Bulgaria’s accession to Schengen area, there where ministers from the member states who stated that the discussion about the future of the Schengen should necessarily include the situation of RO and BG.”, mentioned minister Carmen Dan. Over the last decade, conflicts in the various regions of the world or in the EU’s neighborhood determined major challenges for the EU’s internal security and the management of the EU’s external borders, putting into question the proper functioning of the Schengen free movement area and its benefits for the European citizens and economy. Furthermore, the increasing of the terrorist threat in recent years in several Member States proved that there is the need to strengthen EU’s internal security, including through new measures that ensure greater coordination of efforts to consolidate the Schengen Area. Therefore, in order to increase internal security and counteract the negative effects of uncontrolled movements throughout the EU, the European Commission has continuously launched proposals to improve measures at the external and internal borders, to introduce modern technologies for the use of national authorities and law enforcement agencies and develop new systems or the existing ones. Regarding police co-operation, the home affairs ministers have discussed about the opportunities offered by the exchange of knowledge in the management of digital data sharing in digital data between law enforcement authorities in order to keep up the dynamics of the criminal environment in the digital age. Based on the expertise of the European Network of Law Enforcement Technology Research (ENLETS), Europol may develop and implement a common procedural and collaborative IT platform for the exchange of knowledge on digital data management. This would make it possible to maximize the use of available resources, avoid overlapping efforts between Member States and European agencies, while benefiting from collective knowledge and expertise to improve the response of law enforcement authorities to cybercrime or facilitated by the cyber environment. Developing an integrated environment of this kind for the transfer of know how regarding digital data for law enforcement authorities requires the allocation of adequate resources, as the European Council demanded in October 2018. As regards the fight against terrorism, a constructive exchange of points of view regarding the recommendations of the report of the European Parliament’s Terrorism Committee took place at the ministerial meeting in Bucharest, analyzing the most appropriate ways concerning this threat to the security of European citizens. The Romanian Presidency assumed as a priority to identify solutions in order to increase cooperation and exchange of good practices between Member States concerning preventing and combating terrorism.